Mels Box of Chocolates: You know you want to join! My loyal readers, both of you, know that I have already been on a weight loss mission and have even lost over 25 pounds. Then came spring break where I did gain a few, but then lost them again going right back to my 159 where I have stayed, and stayed, and stayed another week. So as I was thinking about changing up my routine, Beth created a May Day Challenge and I thought why not join to put a new spin on my endeavor. Of course I am running a little late since it began on May 8th, but I thought I would give the newbies a little head start (aren't I nice) not to mention I have been crazy busy...so without further ado I'm getting started! In order to participate I am supposed to tell you all a few things about myself and my weight story. First of all I began Weight Watchers in January with the goal of losing 60+ pounds. Many people have commented that this seems kind of extreme for me, but I was putting my goal weight around 125 which is what "they" say I should weigh based on my height of 5'3". I honestly am not as worried about the number, but think it would be fantastic to fit into a 6 or 8. I never remember being skinny although I don't think of myself as being really fat either. Just bigger than I would like and now that I am done having kids, and not yet 30, think now is the time to get my body where I want it to be. I have actually been very successful so far with Weight Watchers and enjoy the program because I have never had to say "No, I can't have that because I am on a diet." Yes, I do watch what I eat and make sure I do not overindulge, but if I want a margarita, chocolate brownie sundae, or something else really yummy then I watch my points and make it work. For the first few months I was not exercising at all because honestly I was just too tired. Then hubby bought me a treadmill and now I usually walk/jog about a mile every night. You would think I would have then seen a little boost in my weight loss, but really haven't. In the past month I have hovered right at 159-160 which has put a damper on my mood. I enjoyed losing a pound or more each week and want it to begin again. So now I am jumping in to this challenge to give me a boost. If you want to join me just head over to Tales from the Scales and get on board. 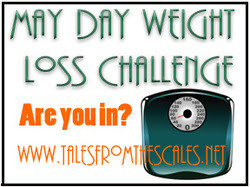 Weigh in will be on Tuesday's and you can even get cute little buttons for your blog to show your success. So what are you waiting for? Go...lose weight...today!! *Now I am off to celebrate my graduation at a hibachi restaurant...please don't check the points!! FYI though I have been saving all week for tonight. Tomorrow is my WW weigh and since I have been neglecting posting my weigh in's I will get post about it tomorrow, Promise! Hey! Cool, girl...glad you joined up! :) Now I'm not so "lonely"...I really think this challenge is helping my "physche" (spelling on that teacher??) Anyways, so good...we're in it together...keep going you've done so awesome already, Mel!! !